Marcus Law has urged his Kettering Town players to seize the “massive opportunity” in front of them. The Poppies take on Paulton Rovers at Latimer Park tonight (7.45pm) in the first of seven home games in a row in the Evo-Stik Southern League Premier Division. Kettering head into the clash on the back of three successive wins, the latest of which was an impressive 4-0 victory at Cambridge City on Saturday. Following Hungerford Town’s 1-0 win over Slough Town last night, the Poppies are eight points off the play-off places but have games in hand on the teams around them. Law is focused on the five home games that remain this month and he knows a big points return will see his team “in the mix” going into April. 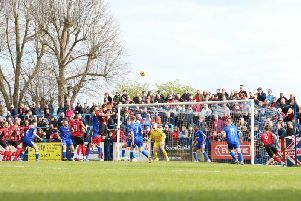 “We have got five home games on the bounce before the end of March,” the Poppies boss said. “It’s a massive opportunity, probably the biggest have had all season and we have got to hope that the boys take it on board and perform well. “And, if the performance isn’t the best, we must make sure we grind out results if things are not going to plan. “All we know is that if we want to achieve what we all want and what we are capable of doing then we have to put these next five games to bed. Paulton have endured a season of struggle and arrive at Latimer Park tonight 10 points adrift of safety and on the back of a 5-0 hammering at the hands of promotion-chasing Redditch United at the weekend. But Law insists his biggest concern remains with his own team, who have been anything but consistent throughout the whole campaign. He added: “It’s all about us. “The only team I am worried about and wary of is us. It’s about making sure the right back four, the right midfielders and the right attackers all turn up and perform on the day. “I spoke to (Redditch manager) Liam McDonald about the weekend and he said it wasn’t as easy as the scoreline suggests. Law confirmed both Rene Howe and Wilson Carvalho will have fitness tests today after they were withdrawn during the weekend success.